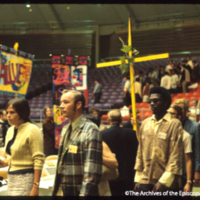 Youth representatives at the Special General Convention held in South Bend, Indiana from August 31 to September 5, 1969. What Good Is The GCSP? “What Good is the GCSP?”, a brochure from the Executive Council about the Special Program. Report produced by the Executive Council of the Episcopal Church updating Church members on the General Convention Special Program, 1968. 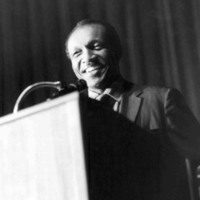 Leon Modeste speaking at the 63rd General Convention in Houston, Texas, 1970. Letter written to ESCRU Director John Morris from the Rt. Rev. 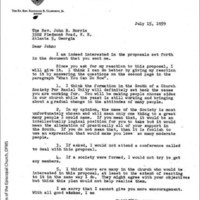 Randolph R. Claiborne, Jr., Bishop of Atlanta, expressing his lack of support for ESCRU, July 1959. 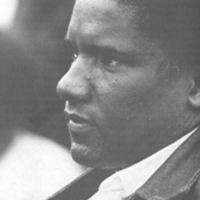 James Forman, author of the "Black Manifesto" and spokesman for the Black Economic Development Conference, 1969. The Black Manifesto, the first major call for black reparations in the twentieth century, issued by the BEDC, April 26, 1969. Archives Research Report on “The Question of Reparations to the African Americans,” 2005. Executive Council’s Response to the Black Manifesto, May 1969.